Lowdown: A nonconformist girl gets her Prince Charming. So much has been said about Jane Austen in general and Pride and Prejudice in particular over this blog recently that I see no point in further introductions. The only thing I will fuss about is me declaring I finally read the book this fuss is all about. With that out of the way, I find the most interesting question to be: what is all the fuss about? What is it that Austen was trying to say in her book that made this book the success it is? A lot of theories have been suggested to answer this call, most of which are mentioned in the modern opening and closing notes accompanying this Penguin edition of Pride and Prejudice that I got to read. They start with the obvious speculations on Austen’s balancing act between giving power to women and aligning with her contemporary society’s ultra conservative ways (at least when judged by modern eyes, as in not through Tony Abbott’s eyes). They move on to theories I find more interesting, theories dealing with more basic philosophy: what does it take for us to say we “know” something? Elizabeth Bennet thinks she knows Darcy and Wickham early on in the book, but three hundred pages later admits her first impressions were wrong. Is there a way for us to come up with objective criteria for determining whether what we think we know is actually the truth? Interesting as that question may be, I much prefer to seek answers to questions such as these with the likes of Bertrand Russell than I do with Austen. 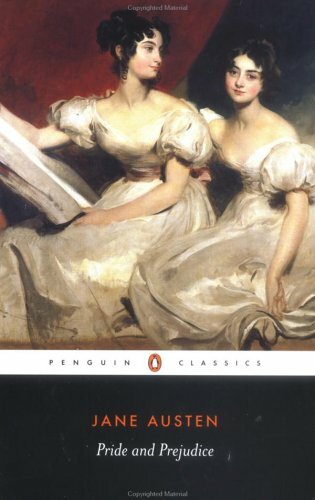 If you ask me what it is that Austen was trying to say in her book I will tell you about my own theory: in my view, Austen’s Pride and Prejudice is an attempt to diversify the English gene pool. I’m serious! Think about it: Elizabeth won’t marry her cousin, Collins, and Darcy won’t marry his cousin, the daughter of Lady Catherine de Bourg. Instead, the two marry one another to create a healthier mix of genes. QED. Other than being silly, what am I trying to say with this theory of mine? I’m trying to say that with all due respect to Austen, hers are not the type of books I would normally read. Not that I suffered reading it; it’s just that with my limited time upon this earth there are books that resonate better with me and the things that are on my mind. For a start, I found Pride and Prejudice to be a bit tedious to read, especially in its first two volumes (the book is made of three). A lot of it is to do with the use of old style English, which is a bit of a pain, and a lot of it to do with the fact that – let’s face it – not much is actually happening in the novel. I mean, the entire affair can be summed up in just a few sentences if you really wanted to do it, an act that exposes a lot about the real charm of the book: the fact that at the core, we all like it because it’s an effective rags to riches story. I also had trouble identifying with the heroine Bennett girl: unlike the filmed versions, she does not stand out much in my modern reader's eyes; in today's world I wouldn't have given her the second chance Darcy does. While I admit that she lived in a different world to mine, a world where conventions were strict, my point is that there is too much of a gulf between my world and Austen's for me to truly enjoy Bennett's story. That said, Austen’s writing demands a lot of respect. The articulate way she uses even the basic of things – stuff like card games – to differentiate between different people and what we should be really thinking about them is quite amazing. She does have her lesser moments, though, like when she explicitly tells us that Elizabeth is her mother’s least favorite daughter; I would have preferred this impression to be conveyed through dialog or an event taking place instead, especially in this book that is all about impressions (Pride and Prejudice's initial title was "First Impressions"). Still, I liked this peek into the world as it was two hundred years ago. If anything, it shows how people at the time couldn’t write a letter for the life of them: all the letters quoted in the book, some over a few pages long, are just one big block of text. Hey, 17th to 18th century letter writers, have you heard of the use of paragraphs? Think about your reader. Think readability. What I enjoyed the most during my reading was the ongoing comparison between the original book and the various interpretation of it I have encountered, in particular my favorite – the 1995 mini series with Colin Firth. It was nice to identify the discrepancies between the two and to wonder why they were there. Given that I already knew the book’s plot very well before reading it, this study of differences proved out to be my main source of enjoyment from this reading experience. You can say mine was an analytical read, simply because I had no other choice. Overall: Good, but not my usual cup of English tea. 3.5 out of 5 stars.